Radiofrequency thermocoagulation of the cervical posterior medial branch is used for reducing chronic neck-shoulder pain and nape-back pain which derived from facet joints due to cervical spondylosis for a long period. The patients lie prone or supine according to the upper or the lower medial branch neurotomy. When the insulation needle is contacted in the target deep branches around the hollow of joint column under C-arm fluoroscopy, the radiating pain is obtained. The contraction of paravertebral muscle at 5 Hz and the radiating pain at 50 Hz could be verified. The best needle position in thermocoagulation is the point which the radiating pain is gotten by electrical stimulation with pulse width of 1 ms and low voltage of less than 0.5 V. Without the complications after radiograph with contrast medium and a 0.5 mL of 2% mepivacaine, the radiofrequency is performed by thermocoagulation at 60–90 °C for 90 s. The complications include temporary skin hypoesthesia, dorsal muscle power weakness, pain enhancement, and residual pain. 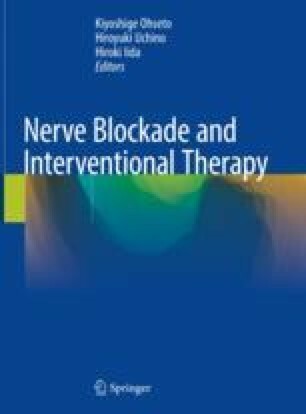 Radiofrequency thermocoagulation of cervical posterior medial branch for chronic neck-shoulder pain is performed by neurolysis at 60-90 °C for 90-seconds on the target deep branches around the hollow of joint column under fluoroscopy.